I've got quite the Saturday Sparkler to share with all of you today -- there are few tiaras in the world that are as interestingly composed as this one, to say the least. With a royal history that began in Spain and ended a few years ago in Germany, this sunburst tiara is a truly intriguing piece. The diamond tiara entered the Bavarian collection in 1883, when Infanta María de la Paz of Spain married Prince Ludwig Ferdinand of Bavaria, a first cousin of the nation’s last king, Ludwig III. The tiara was one of María’s wedding gifts from her mother, Queen Isabella II of Spain. The large fleur-de-lys element in the center of the tiara served as a reminder of Maria’s Bourbon heritage; it is a symbol of the royal house. The central element, including the fleur-de-lys, is unusual in that it is set en tremblant, which means that it moves slightly as the wearer moves. The women of the family continued to wear this tiara to major royal events in the years before they decided to put it up for sale. Ursula of Bavaria, who is married to Maria’s great-grandson, Leopold, wore it to Albert and Charlene of Monaco’s wedding reception in 2011. Her daughter-in-law, Anna (who was born into the Sayn-Wittgenstein-Berleburg family), wore the tiara to the big royal wedding in Sweden in 2010. The tiara even graced the head of a Bavarian bride, Felipa, in 2012. 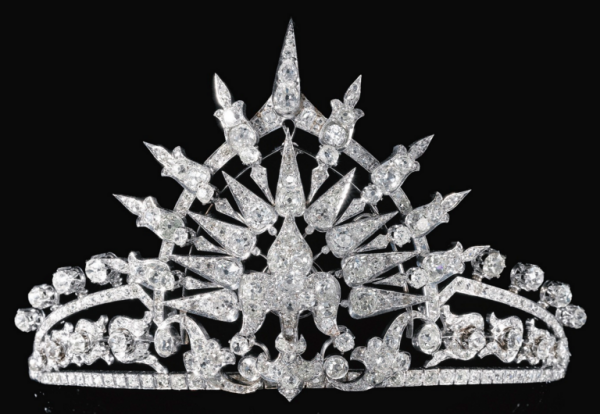 But for reasons unknown (though likely financial), the family decided to put the tiara, as well as some other jewels, up for auction in May 2013 at Sotheby’s. Auction estimates noted that the tiara was expected to fetch between $100,000 and $150,000, but when the hammer fell, a lucky buyer had splashed out more than $180,000 on the piece. If it was you, congrats! But be careful -- I really think this tiara could be classified as a weapon!